Perth racer Rory Skinner scored his first pole position in the Pirelli National Superstock 600 championship today, topping the timesheets in the single 25-minute qualifying session around the Silverstone National circuit. 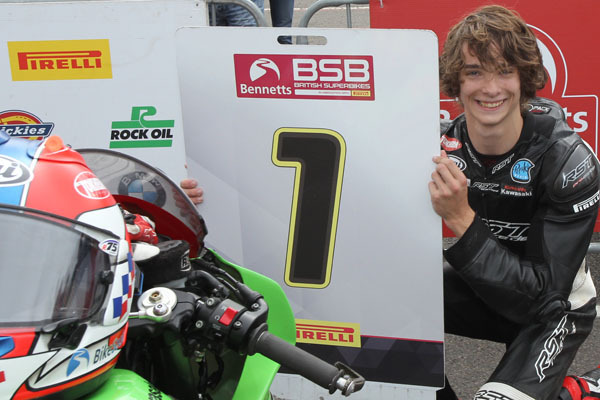 The 16-year-old racer, who won the British Talent Cup race around the full Silverstone Grand Prix circuit two weeks ago, averaged almost 103mph around the 1.64 mile layout on his Bennetts Tokheim Kirkcaldy Kawasaki ZX-6R, with a best lap of 57.428 seconds to take pole from series leader Ryan Vickers by 0.286 seconds. Silverstone marks Rory’s second appearance in the superstock class. The young Scot raced at his home round at Knockhill in July, where he was pipped for the win by less than one hundredth of a second. Having topped Friday’s opening free practice session, and running second despite a technical problem which sapped power from his machine in FP2, Skinner’s family run team fitted new tyres and made a few small changes to ZX-6R for qualifying. With an earlier rain shower meaning that there was only a narrow racing line around the circuit, Rory built up pace before setting his best time on lap nine. After sitting out the mid part of the session, Rory rejoined the track to put in four more laps at racing pace before the chequered flag came out. Tomorrow’s 22-lap race is scheduled to take place at 11.10am, with live timing and commentary available at the Bennetts British Superbike Championship website. Race highlights will be shown British Europsport 2’s British Superbike Extra programme on Monday at 6pm.